Holt’s Cigar Company, which is mostly a mailorder outfit unless you’re in the Pennsylvania area, has their own line of cigars: Old Henry, which are available exclusively from them. If Old Henry isn’t a familiar name to you, it wasn’t to me either. If, however, you pop the hood on these stogies (or simply look on the bottom of the box), you’ll notice a very familiar manufacturer behind them: the Garcia family. If that’s not ringing a bell, the Garcia family blends cigars of their own brands, including My Father (Cigar Aficianado’s cigar of the year last year ) and Flor de Las Antillas (cigar of the year in 2012), then they also blend the Tatuaje family of cigars, and occasionally some others, too (like this one). Based out of Esteli, Nicaragua, the Garcia family has a good reputation for blending great cigars, and these Old Henry blends are no exception to the rule. 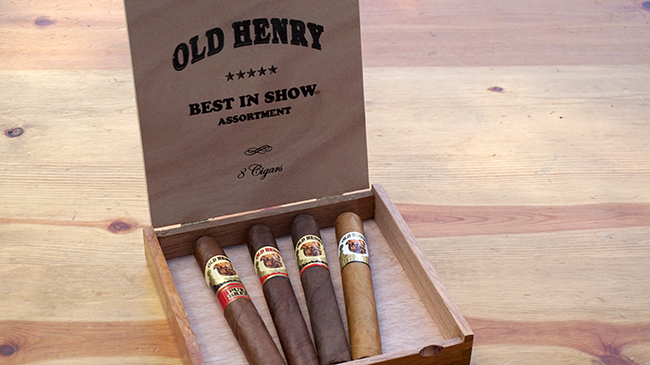 I got to try the “Best in Show Assortment” of Old Henrys, which includes 2 each of Pure Breed, Old Henry, Maduro, and Gold Label blends, all in Toro size (6×52), packed in a cedar box. These retail at $5.50 each for the last 3, and under $6.50 for the Pure Breed. The Best in Show Assortment will run you $29.99 from Holt’s. Pure Breed. Medium-full bodied; medium strength. Nicaraguan tobacco in a Ecuador Sumatra wrapper. Smokes sweet and spicy with quite a bit of earthy flavor in the wrapper. Flavor profile is the most complex of the bunch and varies between spice, earth and pepper throughout. Old Henry. Full bodied; medium strength. Nicaraguan tobacco in a Nicaraguan Corojo wrapper. A spicier experience, plus cream and leather. Highly flavorful, yet the strength is very manageable. Maduro. Full bodied; medium-full strength. Nicaraguan tobacco and Connecticut Broadleaf maduro wrapper. Similar to the standard Old Henry in spice, but more chocolately and wet overall. Gold Label. Medium bodied, medium strength. Nicaraguan tobacco and Ecuador Connecticut wrapper. The lightest blend of the bunch, but just barely lighter in its profile. Still plenty spicy though also creme brulee, vanilla and cinnamon notes. 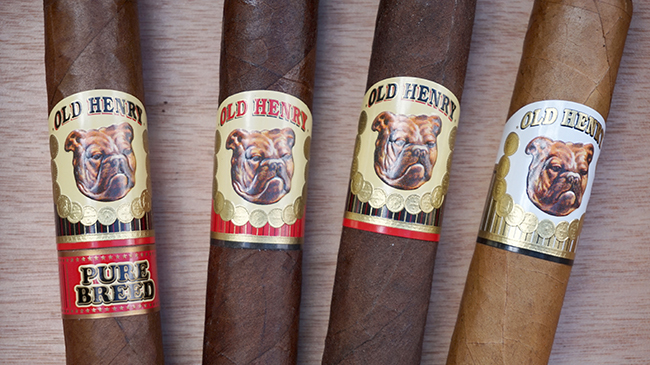 This entry was posted by admin in cigars and tagged holts, holts cigars, old henry, old henry cigar review, old henry cigars, old henry pure breed on May 6, 2016 .